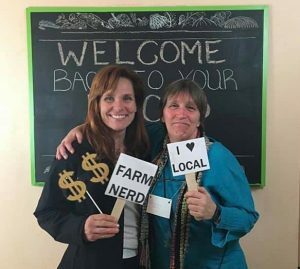 February and March were busy for FMC staff, who have been traveling to conferences from coast to coast meeting with farmers market leaders, hearing the issues facing the local food sector, as well as learning about potential solutions. California Small Farm Conference, attended by FMC Executive Director, Ben Feldman, has a multi-decade history of supporting programming for farmers and market managers. Beginning in 2016, that conference announced a shift away from the conference hotel model in an effort to bring a bring down costs and broaden attendance. Now hosted at the UCDavis Student Farm, the 2019 conference reflected the shift in the conference. The two day conference opened with day-long trainings and field days, including a farmers market manager training from the California Alliance of Farmers Markets. Day two included workshops which took place in classrooms, outside, and in the student farm workshop with topics ranging from Korean Natural Farming to a Policy Forum. The event closed with a delicious meal, awards, and dancing as part of the 6th annual Agrarian Lovers Ball. 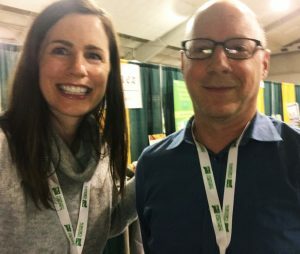 FMC Senior Advisor, Darlene Wolnik opened Oregon’s annual farmers market meeting with data collection, sharing presentation screen time with metrics partner, Daniel Westervelt of Farmspread. FMC and Farmspread showed off the data collection and reporting functions for farmers and markets of both platforms. Oregon Farmers Market Association was awarded an FMPP grant in 2018 to pilot their Beginning Vendor Support Network, a capacity-building project to study and support five small to medium-sized farmers markets in their role as business incubators. That project is using Metrics and Farmspread platforms to collect and use data among its markets. The practitioners on the panel included Becky White of the Clatskanie Farmers Market, Lisa Hall of Portland Farmers Market, Amanda Pastoria of Umpqua Valley Farmers Market, and researcher Dr. Mallory Rahe of Oregon State University. All of the market leaders (ranging from rural to urban markets) offered relevant tips and resources for markets creating their own data strategy, and Dr. Rahe shared how vendor level data at markets will be useful in her project analysis. Besides resource sharing, the meeting included awards to leaders voted on by Oregon peers, show-off corner for markets to share their materials, discussion groups on topics such as vendor recruitment, inclusion and diversity strategies, insurance issues, food safety and benefit program updates from program leaders, and a midday yoga stretch led by Portland Farmers Market Executive Director Trudy Tolliver. Dar also attended the extremely energetic, day-long Oregon Small Farms Conference. 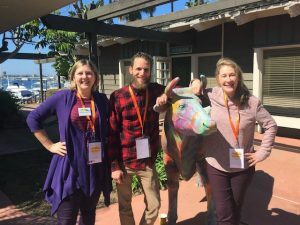 The event was geared toward farmers, agricultural professionals, food policy advocates, students and managers of farmers markets, and hosted by Oregon State University Extension. Twenty-seven educational sessions were offered on a variety of topics relevant to Oregon’s small farmers. FMC participated in the “Applying for Federal Grants: FM/LFPP (Farmers Market/Local Food Promotion Program) and More” panel. Other speakers included Samantha Schaffstall, Management and Program Analyst, USDA AMS; Kelly Crane, Executive Director, Oregon Farmers Markets Association; Becky White, 2015 FMPP Recipient Project Coordinator, Clatskanie Farmers Market. 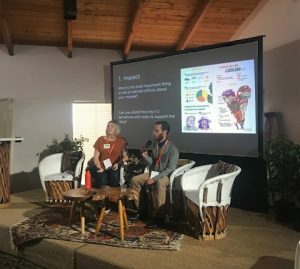 Having grown out of a training for potential farmers market vendors, the InTents Conference in San Diego is unique in providing content focused on how to be a successful vendor at farmers markets. FMC was well represented at the conference with workshops from Executive Director Ben Feldman and Board Member Sagdrina Jalal. Conference attendees came from all over the US as well as multiple Canadian provinces. The geographic variety of attendees led to many rich discussions both in and out of workshops. One aspect of the conference that others would do well to emulate was the use of farmers market vendors as event caterers. Jen Cheek, FMC Director of Programs presented a session on Risk Management for Farmers Markets, featuring the Farmers Market Legal Toolkit and served on a panel titled, “Leveraging Consumer Shopping Habits for a Successful Market.” The panel highlighted that the current consumer’s definition of “Local” is more about values than location. Shoppers who are seeking local products are actually more interested in the story of the people producing the food and the farming practices that made it possible. FMC’s Ben Feldman presented on the process and outcome of the 2018 Farm Bill passage at the California Market Match Consortium’s Face to Face Meeting. Led by the Ecology Center, the California Market Match program is the largest nutrition incentive program in the country and brings together the 50 farmers market operators who implement the program at 300 farmers markets around the state of California. You can see Ben’s take on the 2018 farm bill process and the results for the Food Insecurity Nutrition Incentive Program here. 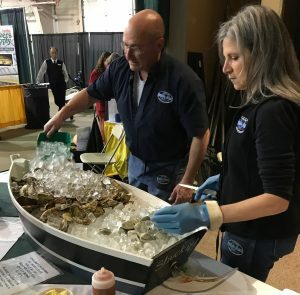 While each state faces unique challenges in their food system, few can hold a candle to Alaska. In spite, or perhaps because of this, Alaska Food Policy and the Alaska Farmers Market Association are a tight knit group, working in collaboration to build a stronger, healthier, more equitable food system. Conference organizers invited FMC’s Ben Feldman to present their Keynote speech, facilitate the Farmers Market Association strategic planning session, and present multiple topics. The event also caught the attention of Alaska’s Senators with Senator Murkowski sending a video message and Senator Dan Sullivan speaking in person. While the programming was top notch, the highlight of the event was a rousing live benefit auction hosted by Jodie Anderson, Director of the University of Alaska Fairbanks Matanuska Experiment Farm.